“NOURISH, THRIVE< HEAL: A comprehensive and holistic approach to living with Lyme disease." 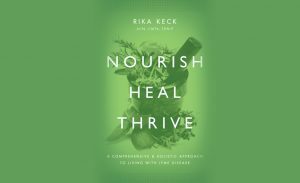 Written by Rika K. Keck, a committed health advocate and voice for those who are sick with Lyme and co-infections. Lyme infection and toxic exposures could have triggered a cascade of chemical sensitivity because of an already compromised immune system. An individual’s ability to detox is a major factor in how the body handles the burden of Lyme and coinfections and how it responds to therapeutic interventions when dealing with vector-borne infections, viruses, or mold illness. This must be seen in context with the onslaught of factory-produced toxic pollution in our air, food supply, soil, oceans, and rainwater. All of these toxins can accumulate in the body, and, thus, we must be proactive in helping our bodies to get rid of them. If toxins are not eliminated, they build up, which can cause or contribute to Lyme-like symptoms such as palpitations, joint pain, skin eruptions, or headaches. The kidneys and liver are both major elimination channels; however, we must also include the skin, colon, lungs, and lymph as important detoxification pathways. If one channel is clogged, the body will attempt to use other channels. It is not just infections that create health problems; it is also the accumulated chemical toxins from the environment that trigger low-grade and sustained inflammation, which keeps us sick. AND THE FLASH SALE IS ON FEB.23-26th, when you can buy your electronic copy for $0.99! or purchase your soft cover edition right now for $15.95 on Amazon.com. IS IT NOT TIME TO BECOME BETTER when living with chronic Lyme?